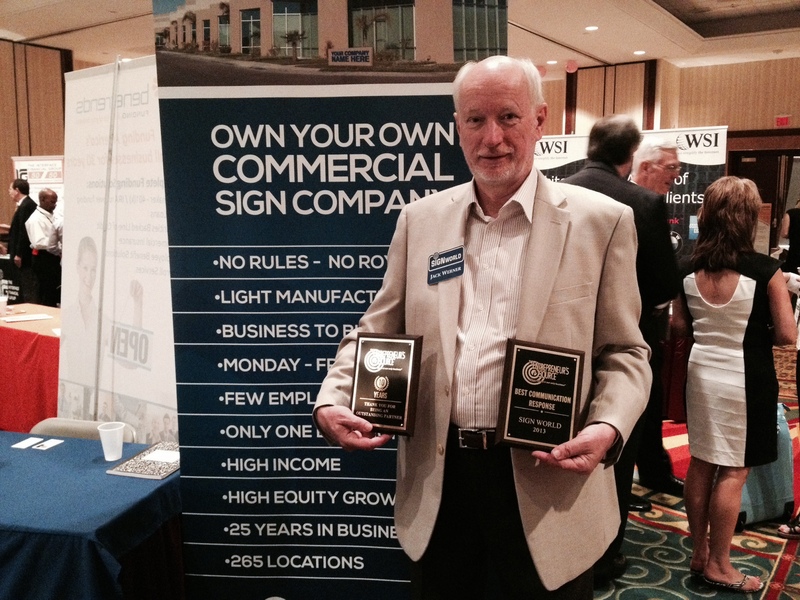 October 4, 2013 – Ft. Lauderdale, FL — Signworld was recently nominated for three awards by The Entrepreneur’s Source, winning the award in the “Excellence in Communication” category. Signworld was also presented with the “10 Year Award” by The Entrepreneur’s Source, one of the leading franchise coaching organizations, at their annual conference. The “Excellence in Communication” award, which had 7 nominees, was presented to Signworld for their keen ability to effectively communicate with prospective Signworld owners as well as the franchise coaches from The Entrepreneur’s Source. “Communication is one of the most important things in life and business, and we are extremely proud to win the award in this category. We work hard each and every day to make sure that our communication and interactions with coaches and prospective owners are on point. Without communication, you cannot build trust and without trust you don’t have much.”, said Jack Werner, Signworld’s VP, of the award. Signworld was also presented with the 10 Year Award, for partnering with The Entrepreneur’s Source for the past for 10 years. Signworld was one of six companies presented with this award, and the only company to have partnered with The Entrepreneur’s Source for the past 24 years. “This award, although not given for any specific reason other than participation, is one that we will continue to grow on. Most partnerships tend to fade over time for a number of different reasons. The true partnerships are the ones that not only last, but also provide beneficial results for all involved. We appreciate our partnership with The Entrepreneur’s Source and look forward to continuing it for many years.”, added Dan Werner, Signworld’s VP of Operations. Signworld offers a turn-key business opportunity in the full-service signs & graphics industry. Signworld has 270 sign companies in North America and has a number of viable future territories available for new owners interested in joining Signworld. 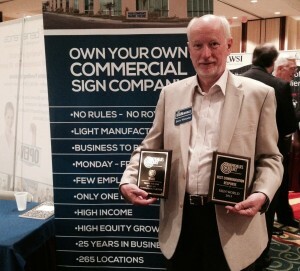 Contact us to learn more about how you can become a Signworld Owner. The Entrepreneur’s Source, also known as TES, is one of the leading franchise coaching organizations in the world. With over 250 coaches throughout the US and Canada, they represent some of the leading franchisors and business opportunities available for individuals to partner with. Their coaching process is provided at no cost to the individual and is geared towards helping the individual find the right franchise or business opportunity to fulfill their desire to be a business owner.